Tell us what you think! Write a Review online by clicking here. "Recently, my mother, Virginia, was referred to a specialist for assistance with obtaining hearing aids. 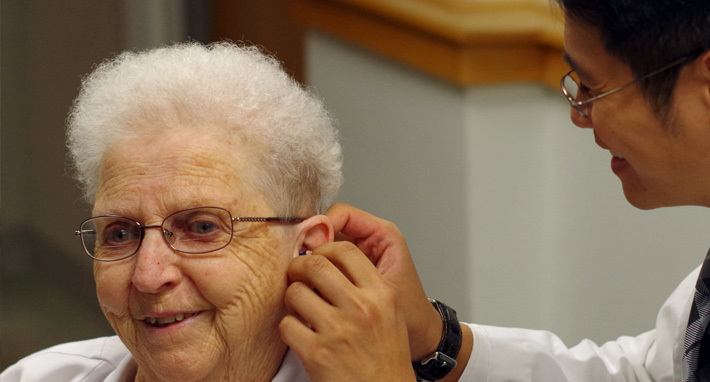 She has a significant hearing loss and has been to several audiologists for help. She had purchased hearing aids that she thought was a good deal for the quality she was getting, but was never able to use them as she couldn't hear well with them and they whistled constantly, so aggravating to the point that she gave up wearing them. Unable to hear well left her in the dark, and unable to have conversations, share in family and social events and even left her unsafe in her own home. A referral was made to Peter Lee, BC-HIS. He is one of the most patient and caring professionals we've ever met. He went above and beyond the usual amount of time required to assess her problem. His main concern was to get it right the first time, which is clearly not the case as the above history states. My mother was a difficult case to work on but Peter Lee didn't see this as a barrier. He worked with her and myself until he got it right and then ordered her a pair of hearing aids he felt should work for her. These came in fairly quickly and another appointment was made to set them up and get working for her. She was so pleased to actually be able to hear again and to have comfortable aids that didn't drive her crazy from whistling. I consider Peter Lee, a one of kind professional in his field. His work with his clients is outstanding, a cut above! 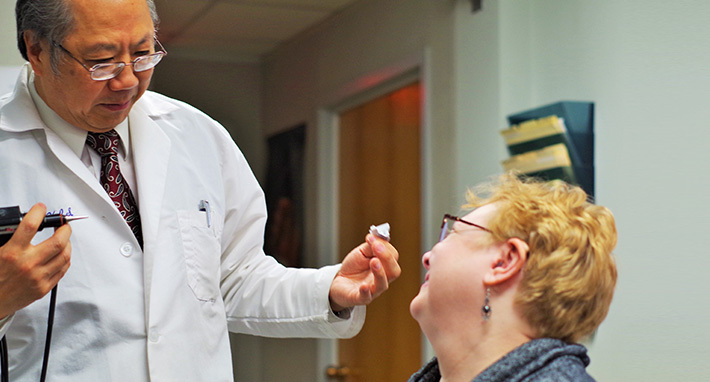 We are both very grateful to him and will continue to spread the news that an incredibly brilliant, professional hearing specialist practices right here in the town of Westborough. Thanks again to Peter Lee for his Gift to us, the gift of hearing!" I was very impressed with my treatment from Professional Hearing. They solved a problem that baffled three professionals previously. I am grateful and recommend them to all needing hearing help. Bless be the day, I went to you for a hearing aid. I am completely satisfied with it. Sometime in the past (when I was teaching), I did have hearing aids but they certainly could not compare with this one. ‘Complete Satisfaction’ that is how I describe this one. Furthermore, I greatly appreciate the concern you show your customers giving them all the proper instructions concerning the use and care of their hearing aids. Thank you ever so much, Mr. Lee and rest assured that I recommend you to all in need of hearing aids." It gives me great pleasure to write to you how much you have improved my ability to hear and hence the quality of my life. My son, relatives, and friends are grateful as well. As a WWII veteran with a severe hearing loss due to nerve damage, I have never encountered during those fifty-six years anyone with your dedication and expertise in your profession. You first tested me and programmed my hearing aids on August 17. Since then, you have retested me and refined my hearing aids three times. The result of your persistence for excellence has greatly benefitted me. You will always be highly recommended by me." This is a long overdue note to let you know that my son, B is doing very well at his newest school. Thank you so very much for the help you provided in getting his FM system all set for him. We are very grateful. I am writing this letter to convey my experience in selecting my hearing aids. In May 2015 I went to my local Senior Center to receive a free hearing test as my hearing had been deteriorating for many years. Mr. Peter Lee and his son Mr. Alex Lee from Professional Hearing were administering the tests and I knew how professional, knowledgeable and courteous they were as I used to take my late Dad to them for his hearing needs. Mr. Alex Lee gave me the preliminary exam and explained the results which weren't surprising to me. I then followed up at their office in Westboro to have a full evaluation done and to try some hearing aids. I was given the opportunity to wear them for a couple of weeks on a trial basis which I found very helpful as I wanted to see how I could hear in the world I live in and not just in their office environment. I must admit that I was so ready for them and couldn't believe the difference in what I could hear. It was overwhelming to hear again and it brought me to tears. I missed so much over the years. On the way home that day, I could hear the signal lights clicking in the car. I could hear all the rattles in my 6 year old car too. The wind in the air on that warm June day was something I couldn't hear for many years. I couldn't wait to wear them to Church, where I was having the most trouble, and I could hear so well. Work was my next place to try them and boy could I hear a lot — even the voices across the hall! I didn't tell my co­workers as I wanted them to talk in their usual voices so I could see if there was a difference and there certainly was. I then went to a noisy restaurant to check out how I could hear — a good excuse to eat out — and it was okay. I can also hear when I drop things now. After a couple of weeks, I returned for some adjustments and was sent off to try them again still on a trial basis. Never once did I feel pressured to purchase them. In fact, both Mr. Peter Lee and Mr. Alex Lee encouraged me to take my time as they wanted me to hear the best I could and to be comfortable with the hearing aids. After a few more adjustments, four total, I decided to buy them and have never regretted it one bit. One thing I want to mention is that with each adjustment, voices were much clearer, not just louder, and all the people that I thought were mumbling their words, really weren't — it was my hearing loss that was causing me to hear so poorly. I also started going to social events again, it was too much trouble to go before as I couldn't hear conversations anyway. I also used up a lot of energy trying to strain to hear and now I have more energy and enjoy being with people again in social situations. It's hard to believe how comfortable my hearing aids are — I put them in after getting ready for work and they stay in all day and they only come out when I go to bed - about 18 hours later. A few times I forgot to take them out when I went to bed and when I felt them still in, I got up and removed them. Another wonderful feature is they don't hum or "sing" to me like many hearing aids do, and they let me know when the battery is low by saying "battery low" preceded by a couple of beeps at which time I usually get another hour out of them. I've now had them for 8.5 months and I can't say enough positive things about my hearing aids and God help the person who tries to take them away from me! I do want to add that going to Professional Hearing is like going to visit best friends; it is a friendly place and they encourage me to ask questions. In no way did anyone ask me or influence me to write this; I'm so excited to hear again and am so satisfied with my hearings aids, that I want the world to know and I encourage anyone who is having trouble hearing, to go and get an exam and hearing aids if need be. You won't feel so isolated and/or depressed in this world and you'll feel more inclined to enter the "hearing world" again and have more fun with family and friends. When I see people now I say "it's nice to see and hear you again". Thank you Mr. Peter Lee and Mr. Alex Lee. My hearing aids are just great and working very well. I love them so much and can't get along without them." This letter is being sent to you to thank you for your assistance when I needed help with my hearing aids. When you sent me to Peter Lee at the Hospital, much to my surprise, Mr. Lee did several things for me that no one else had ever done. He gave me a hearing test, made impressions, and ordered the aids-all in one visit. He also took valuable time to truly listen and find out my particular needs. On the second visit, he fitted the aids and gave me a hearing test with the aids ‘in’ to see where the level of hearing was with new equipment. The comfort of the molds and sounds exceeded and anything I have ever experienced in the past 20 years. He even gave me a ‘breaking-in schedule’ for my ears to adjust to the new level of sounds. I would highly recommend Mr. Peter Lee to anyone finding difficulty in hearing. The experience was very professional and caring! 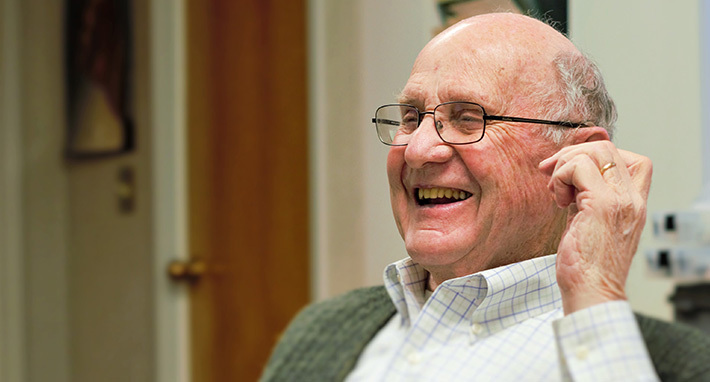 My thanks to you and Mr. Lee for helping to make the quality of my hearing so much better." I’m writing to thank you for being so very kind to my husband. It’s not often that Professionals take enough time with the elderly. You took time, and made sure my husband and I understood everything about the hearing aids, the care, and use of them. On the way home from your office, he heard the wind and the traffic. He smiled. He smiled again when we arrived home and heard the rustle of leaves on our maple tree, and smiled at the music of birds in that tree. Smiles are something my husband hasn’t done in quite a while. So again, thanks for bringing smiles back to us both. He listened to TV last night and the sound was lower than it has been in years. Now we sit in the same room to watch TV. Usually I have to go in another room, shut the door, and watch the other TV. No more headaches for me, thanks to you and the hearing aid Mr. Lee, you are someone special and I‘m so glad we found you. May you have a long and happy life, and success in everything you want to do." Sincerely and God Bless you. I am a wearer of hearing aids. I was born with a hearing loss. As I got older, between working in loud music clubs, motorcycles and the general loudness of my life, my loss became a burden. Not only was my hearing diminished, I could not understand speech. My deafness started to affect my personal life as well as my social life. People were tired of repeating themselves and finally just stopped trying to communicate with me out of frustration. I came to see Peter Lee and my life has changed immensely. It’s awesome to be able to shut off the TV close caption and to be able to hear a conversation in a crowded club. It’s nice to hear a whisper. At the rate I was going, I would have gladly worn Fog Horns on my ears! Anything to be able to hear and understand people! But fortunately I now wear my hearing aids- constantly! They fit neatly into my ears, are slightly visible and boy are things looking up! I no longer talk loudly or yell to be able to hear myself. I keep my stereo and TV at normal levels, much to my neighbors relief! My friends joke with me that they can’t talk about me anymore because I CAN HEAR THEM!! Ha! Ha! I’ve been told I'm setting a good example for other hearing aid wearers who are young like me. My friend told me I make her feel less self-conscious about the aids because I let mine be seen. Thank you so much Peter." As promised, here is an update with respect to my new hearing aids. I have used them in restaurants with loud background noise to find that I can hear conversations that I could only partially hear previously. I have also worn the hearing aids to basketball games to find that I can more clearly hear the words spoken by people around me. Last night I heard a high school concert with greater clarity than in a very long time." I just want to let you know how much I am enjoying my hearing aids. It is great to hear people talking to you. It is a joy and a blessing. I think it is the worst thing that can happen to anyone when they lose their hearing. It is a very lonely life. People are talking and you do not know what they are saying. You feel you do not belong in their company. I thank God and I thank you for the joy of being able to hearing again. I am very surprised that I got used to my hearing aids. I did not think I would get used to them being in my ears. I wear them all day and do not know I have them in my ears. Thank you again and may you help many more people as you have helped me." Thank you so much for your help and thoughtfulness in obtaining my 92 year old dads new hearing aid; it’s opened a new world to him he hasn’t had in many years and he loves it." I want to tell you how much I enjoy wearing the new hearing aids that I purchased from you. After having two other evaluations in the past few years, the one you gave me was so thorough, and you explained everything so well. I really adjusted to them very quickly. In fact, last night I forgot to remove them before going to bed, so I have to get up and take them out. They’re very comfortable in my ears, and I keep them in all day. The first time I watched a movie on TV since I’ve been wearing them I could hear and understand every word, which seemed remarkable to me, as it’s been quite a while since I’ve been able to hear conversations clearly. I’m so glad that I saw your advertisement in the news and decided to take advantage of it." I am writing to express my sincere appreciation for the recent service you provided me. Having made a substantial investment in a pair of hearing aids sold to me by another company, I was extremely disappointed in the quality of sound and the fact that they fit so poorly, and caused such discomfort that I was unable to use them. In explaining my dilemma to you, you listened carefully and patiently. You then proceeded to examine my ears and compare their shape to the molded hearing aids. Recognizing the problem, you set about re-contouring them until they fit comfortably and correctly. With the better fit came a much clearer sound quality. To say that I am very satisfied is an understatement. For your very reasonable fee, I was able to actually hear again, and salvage an investment that I feared was lost and useless. Without hesitation, I will gladly recommend your services to others like myself, who desire to improve their hearing." Thanks so much for new hearing aid. It works perfectly! Thanks for your kindness and concern. If I ever hear of anyone that is in need of ‘hearing aid’- I certainly will refer them to you Mr. Lee." Just wanted to drop you a short note of thanks for all you did for my mother. Although her hearing has definitely improved what impressed me the most was your patience with her. You made it very obvious that you care about what you are doing by all the time you spent with her. It is something that we don’t see much of anymore today. Once again, thank you and keep up the good work." I want very much to thank you for your many kindnesses to me. I am doing very well so far, my hearing aids are working very well now. Do hope they keep up. I am very grateful for all the help you gave me. May God bless you for it all and help you with your work. Do hope you have a nice Christmas." From all our aging sisters who go to your office for help in hearing, I only hear wonderful things about you. I also take this opportunity to thank you for your recent donation towards the new dining room furniture at H Residences. I was a little embarrassed to learn that one of our Sisters solicited a donation from you. But I know she meant well. Please know that we are grateful for your generosity and for your concern for our elderly." I just wanted to drop a line to say thank you for being such nice people. 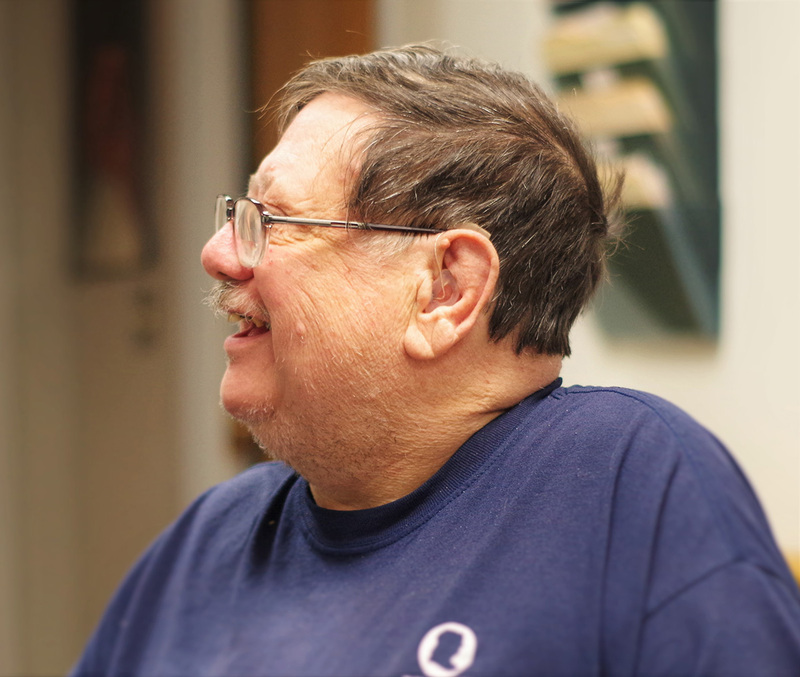 Peter-you have made my life so much nicer by helping me with my hearing problem. Christina- it’s so nice to walk into an office and be greeted by your nice smile. God bless you and your family. I thank you for your expertise and kindness. I really enjoy hearing better." My impression of hearing aids was very negative and a few people I had contact with were not happy with theirs. Your advertisements first attracted my attention as intelligent and sensible. Everything you promised me from the very beginning on future hearing has come true, and I am very happy. Your personality and constant concern of my daily use really proved so helpful. You have a caring manner with your clients. The results are perfect and I thank you for this new world of sounds long lost. My wife thanks you also as she says I have come back to life again. Wishing you and your loved ones many blessings in the New Year." Thank you for the sound of rain drops and other voices." I am happy to jot down a few things from my experiences with trying to find a good hearing aid for me. I had an aid last year which did not give me satisfaction. I went back twice to see if something could be done about it. The first time I was told that maybe I was not used to it enough and give myself time. I accepted that and after two months when I still could not hear I returned to see the person who had tested me and taken the imprint. I was then told that there was nothing wrong with the aid. I continued to wear it but I was not satisfied at all. Then one day I took one of our sisters to see you. Your attitude of attentive kindness and caring for her and the happy results for her made me want to try again for help and this time from you. I want you to know how happy I am to hear what is said around me, and to be aware of what is going on. I am indeed very happy I had the occasion of meeting you and get a real good hearing aid. When and if the opportunity comes up, I will surely recommend you to a sister who has trouble with her aid and is becoming deaf."